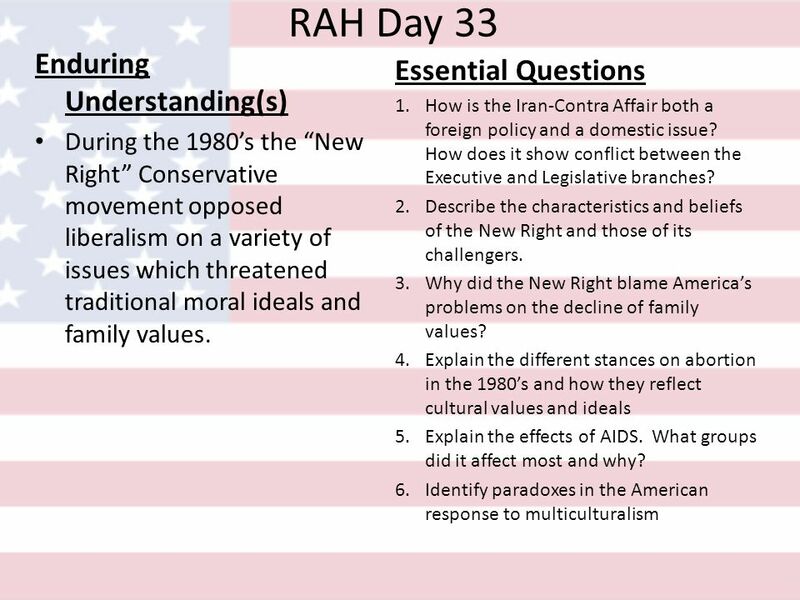 RAH Day 33 Enduring Understanding(s) During the 1980s the New Right Conservative movement opposed liberalism on a variety of issues which threatened traditional. 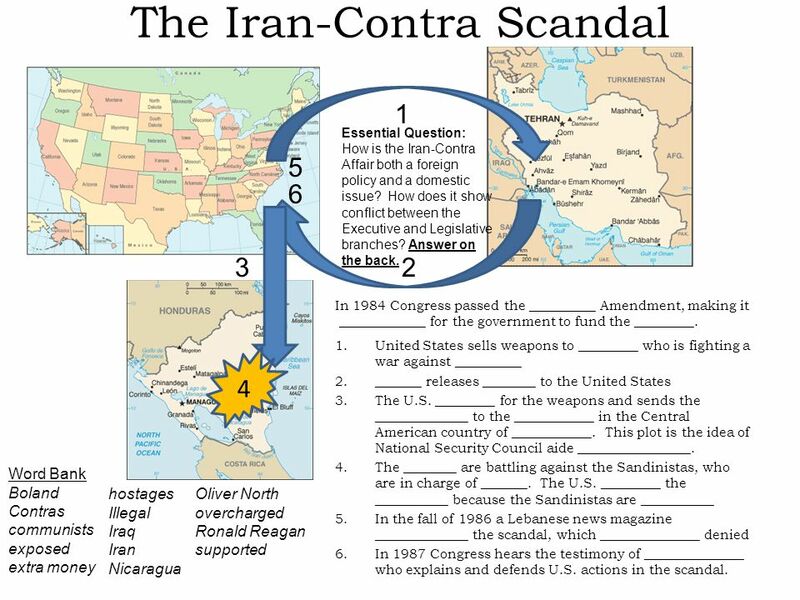 2 Iran-Contra Graphic Organizer Essential Question 1: How is the Iran-Contra Affair both a foreign policy and a domestic issue? How does it show conflict between the Executive and Legislative branches? 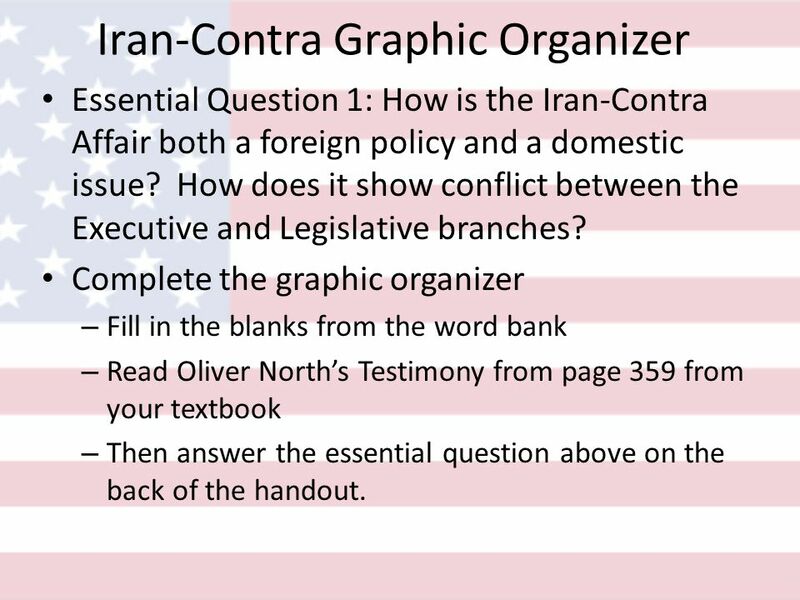 Complete the graphic organizer – Fill in the blanks from the word bank – Read Oliver Norths Testimony from page 359 from your textbook – Then answer the essential question above on the back of the handout. 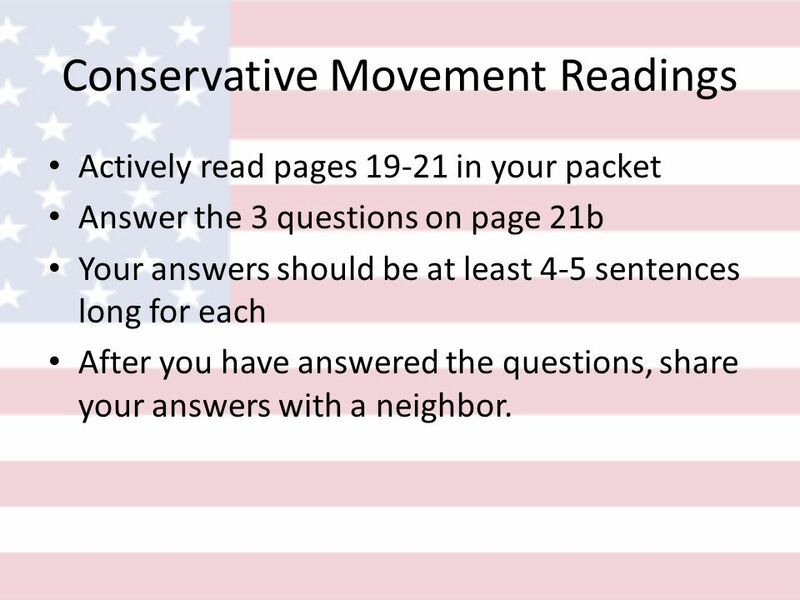 7 Conservative Movement Readings Actively read pages 19-21 in your packet Answer the 3 questions on page 21b Your answers should be at least 4-5 sentences long for each After you have answered the questions, share your answers with a neighbor. Download ppt "RAH Day 33 Enduring Understanding(s) During the 1980s the New Right Conservative movement opposed liberalism on a variety of issues which threatened traditional." 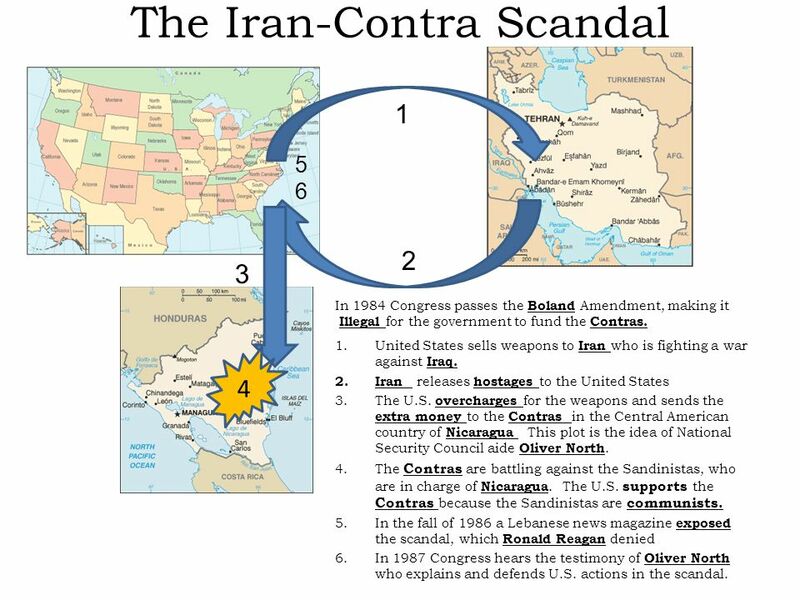 Iran-Contra Affair/Scandal The Convergence of U.S. Cold War and Middle East Policies. *DESCRIBE THE NEW RIGHT -64 GOLDWATER -76 REAGAN -REDUCE FED. GOVT INFLUENCE -DEREG AND REDUCE TAXES -IMPROVE NATL DEFENSE -SINGLE ISSUE GROUPS THAT ALIGNED. Conservative v Liberal What is the difference?. Conservatives Are more likely to be Republican Tend to favor traditional social values  What are some. Resurgence of Conservatism The New Conservatism. Conservatism and Liberalism Liberalism  In America politics today, people who call themselves liberals. 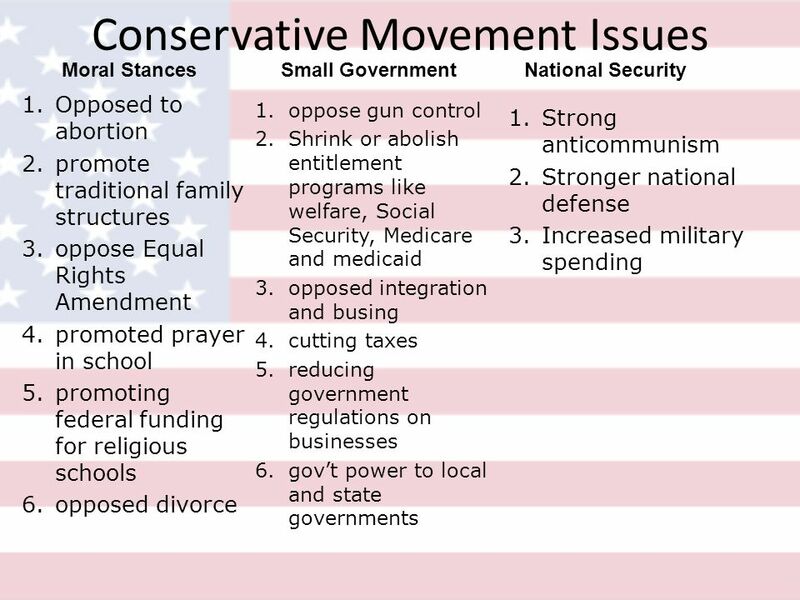 Objectives Describe the differences between liberal and conservative viewpoints. 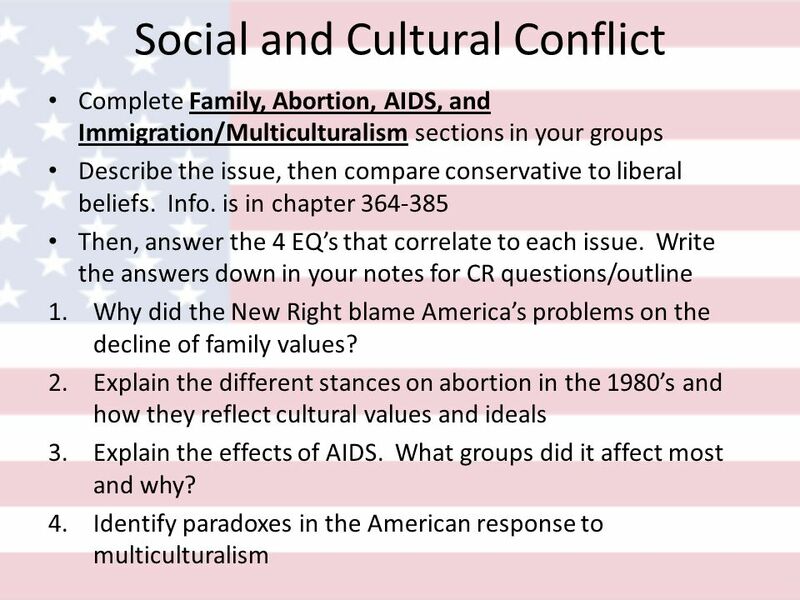 Analyze the reasons behind the rise of conservatism in the early 1980s. Ronald Reagan A Return to Conservatism. 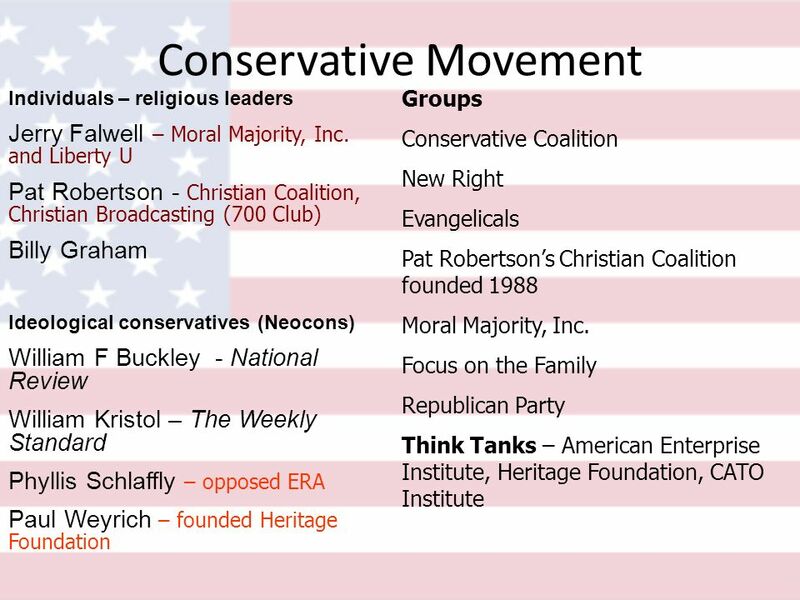 The Conservative Movement Typically a conservative agenda emphasized private interests over social reform 1950s. Section 1 Quiz 1. What political party did Ronald Reagan represent? Objectives Analyze the ways that Ronald Reagan challenged communism and the Soviet Union. Explain why communism collapsed in Europe and in the Soviet. IV. Further Abuse of Power. A. Iran-Contra Scandal. Foreign Policy Ronald Reagan. Reagan’s Approach Reagan is intent on defending the U.S. from what he called the “Evil Empire” He challenges the Soviets. Reagan and the 80’s. America by 1980 ■ By 1980, Americans were ready for new leadership: – The disaster in Vietnam, hostage crisis in Iran, & new tensions. Reaganomics What effect does a changing economy have on American society? Conservativism US History. Conservativism vs Liberalism. Aim: How did Ronald Reagan deal with foreign and domestic issues? Do Now: Define Domestic Policy HW: 981 #1, study for quiz.